╰☆╮A white nail polish (Essie ~ "Blanc"
Step 1~ Apply a base coat. It might seem irrelevant but trust me a base coat will help your polish last and it will protect your nails. Step 2 ~ Pain your nails black. Technically you can choose any background color you wish however I personally feel that black is the way to go since it provides the most contrast and really makes your colorful candy corn design pop. Step 3 ~ After your nails have completely dried, and I stress the word COMPLETELY because for the next step we are going to be using tape to create our triangular shape and you don't want the polish to peel off along with the tape. So once your nails are dry take a piece of tape and stick it down on the back of your hand to get rid of any extra adhesive, rip the tape into two pieces and position them on your nail in an upside down triangle shape. ╰☆╮You can totally make your triangle right side up, however having the point at the bottom of the nail creates a faux claw nail effect which I love since it adds an extra witchy feel to this otherwise innocent nail design. ╰☆╮The tape is great to use as a guide, its fantastic if you don’t have the steadiest of hands, and it makes the process super quick and easy, however if your confident in your nail art skills then you can skip the tape and just freehand your triangles. Step 4 ~ Once the tape is positioned to your liking paint the exposed area with a white nail polish. Not only is this going to be one of the stripes for the candy corn it’s also going to be a perfect base for your orange and yellow nail polish. Step 5 ~ Remove the tape to reveal your perfect triangle shape. From my experience it’s best to remove your tape when the polish is still wet because once it dries you risk peeling off the nail polish from your design along with the tape. ╰☆╮To prevent your colors from feathering and bleeding into each other, give the white polish a few minutes to dry before proceeding with your orange and yellow polish. Step 6 ~ Create a stripe in the center of your triangle using the white triangle as a guide. I found that the width of the brush was the perfect size for my orange candy corn stripe, but off course you can easily make it thinner or thicker depending on the look you are going for and the length of your nails. ╰☆╮If your not comfortable free-handing the stripes then re-tape your triangle outline to be able to quickly paint your stripes without worrying about going outside the triangle lines. Step 7 ~ Apply the yellow the same you did the orange to the topmost layer of your candy corn design. ╰☆╮Once your yellow is applied, you can peel off the tape it you decided to use it, however if you chose to freehand it but made some minor mistakes then you can easily clean it up by carefully outlining and defining the edges once more using your black polish. Step 8 ~ Finish off the nail design with a top coat. A top coat is going to be your best friend, it provides a beautiful shine, it smooths out any bumps, and it’s going to help your polish last. ╰☆╮It wouldn’t be a StarryEyedGlamour tutorial without me giving you guys some options. So I think a fine glitter topcoat would also look amazing with this nail design if you want to add some extra sparkle and pizzazz to your look. 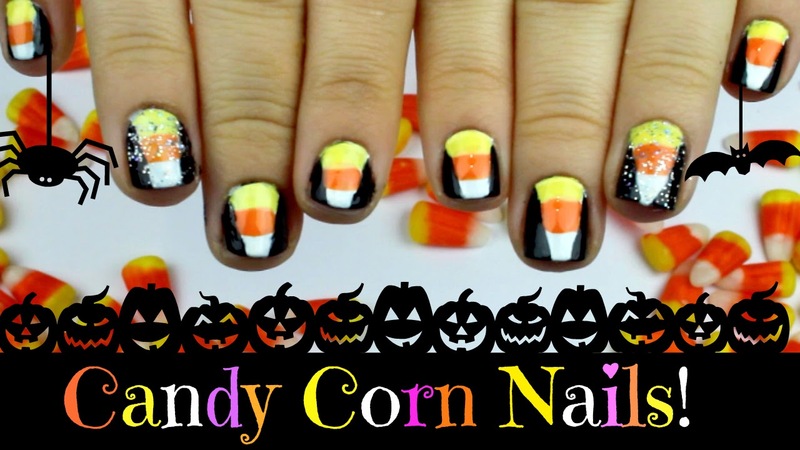 We now have festive candy corn nails to show our Halloween spirit! Please show me your support by following my blog and subscribing to my YouTube channel. Your love means the world to me so thank you for your kindness! Have an AWESOME day!